Your inner history buff will appreciate Casa Loma and The Distillery District. Let the collections at Royal Ontario Museum and Hockey Hall of Fame capture your imagination. Explore Toronto's surroundings by going to Canadian Warplane Heritage Museum (in Mount Hope) and Niagara Parks Butterfly Conservatory (in Niagara Falls). The adventure continues: make a trip to CN Tower. 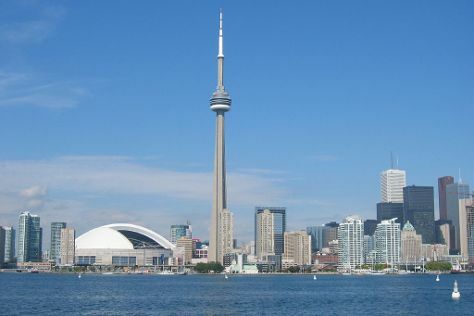 Before you visit Toronto, use our trip planner to discover what you can do and see there. Rio de Janeiro, Brazil to Toronto is an approximately 14.5-hour flight. You can also do a combination of bus and flight; or do a combination of bus and flight. You'll gain 2 hours traveling from Rio de Janeiro to Toronto due to the time zone difference. Prepare for much colder weather when traveling from Rio de Janeiro in April: high temperatures in Toronto hover around 13°C and lows are around 3°C. Finish your sightseeing early on the 24th (Wed) to allow enough time to travel to Sydney. Sydney is a population centre and former city in Nova Scotia, Canada. Get a sense of the local culture at Fortress of Louisbourg National Historic Site and Alexander Graham Bell National Historic Site. Popular historic sites such as Jost House Museum and Holy Redeemer Parish are in your itinerary. Get out of town with these interesting Sydney side-trips: Ski Ben Eoin (in East Bay) and Ski Tuonela (in Baddeck). There's still lots to do: view the masterpieces at Cape Breton Centre for Craft and Design and take in the architecture and atmosphere at United Heritage Church. For other places to visit, ratings, more things to do, and more tourist information, go to the Sydney online trip builder . Traveling by flight from Toronto to Sydney takes 4 hours. Alternatively, you can drive; or do a combination of train and bus. The time zone changes from Eastern Standard Time (EST) to Atlantic Standard Time (AST), which is usually a 1 hour difference. Prepare for little chillier weather when traveling from Toronto in April: high temperatures in Sydney hover around 6°C and lows are around -2°C. Finish your sightseeing early on the 27th (Sat) to allow enough time to travel to Banff National Park. Do some cultural sightseeing at Burgess Shale and Fairmont Chateau Lake Louise. Get outdoors at Sunshine Village and Johnston Canyon. Take a break from Banff National Park with a short trip to Nature & Wildlife Tours in Canmore, about 1h 10 min away. 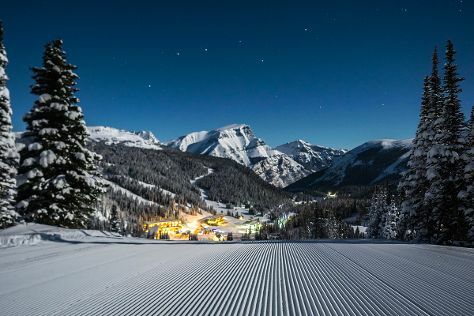 On the 1st (Wed), spend an exhilarating day on the slopes at The Lake Louise Ski Resort. There's still lots to do: take in the exciting artwork at Samson Native Gallery. To see reviews, where to stay, photos, and tourist information, refer to the Banff National Park trip itinerary builder . Explore your travel options from Sydney to Banff National Park with the Route module. The time zone changes from Atlantic Standard Time (AST) to Mountain Standard Time (MST), which is usually a -3 hour difference. In April in Banff National Park, expect temperatures between 9°C during the day and -4°C at night. Finish up your sightseeing early on the 1st (Wed) so you can travel to Tofino. Discover out-of-the-way places like Pacific Rim National Park and Wild Pacific Trail. Let the collections at Reflecting Spirit Gallery and Henry's Carving Shed capture your imagination. Next up on the itinerary: kick back and relax at Chesterman Beach, see majestic marine mammals with a dolphin and whale watching tour, and tour the pleasant surroundings at Long Beach. To see photos, reviews, traveler tips, and tourist information, use the Tofino attractions planner . You can do a combination of shuttle, flight, and bus from Banff National Park to Tofino in 12 hours. Alternatively, you can do a combination of car and ferry; or do a combination of bus and ferry. You'll gain 1 hour traveling from Banff National Park to Tofino due to the time zone difference. Plan for a bit warmer nights when traveling from Banff National Park in May since evenings lows in Tofino dip to 9°C. Wrap up your sightseeing on the 4th (Sat) to allow time to travel to Whistler. Step out of the city life by going to Whistler Blackcomb and Lakeside Park. Eschew the tourist crowds and head to Princess Louisa Inlet and Squamish Lil'wat Cultural Centre. Next up on the itinerary: contemplate the waterfront views at Lost Lake and explore the world behind art at Mountain Galleries at the Fairmont. To see photos, more things to do, traveler tips, and other tourist information, read Whistler road trip planning tool . Do a combination of car and ferry from Tofino to Whistler in 6.5 hours. Alternatively, you can do a combination of bus and flight; or do a combination of bus and ferry. Traveling from Tofino in May, expect nights in Whistler to be little chillier, around 5°C, while days are somewhat warmer, around 21°C. Finish your sightseeing early on the 7th (Tue) to allow enough time to travel to Regina. Step off the beaten path and head to Melville Heritage Museum and Soo Line Historical Museum. Shurniak Art Gallery and Avonlea Heritage Museum will appeal to museum buffs. Explore Regina's surroundings by going to Indian Head Museum (in Indian Head), Mossbank & District Museum (in Mossbank) and Motherwell Homestead (in Abernethy). There's still lots to do: contemplate the long history of Tunnels of Moose Jaw, shop like a local with Yvette Moore Fine Art Gallery, examine the collection at Assiniboia & District Historical Museum, and take an in-depth tour of Weyburn Area Heritage Village. For photos, other places to visit, reviews, and other tourist information, you can read our Regina trip planner. Traveling by flight from Whistler to Regina takes 4.5 hours. Alternatively, you can drive; or take a bus. You'll lose 2 hours traveling from Whistler to Regina due to the time zone difference. In May, daytime highs in Regina are 22°C, while nighttime lows are 4°C. 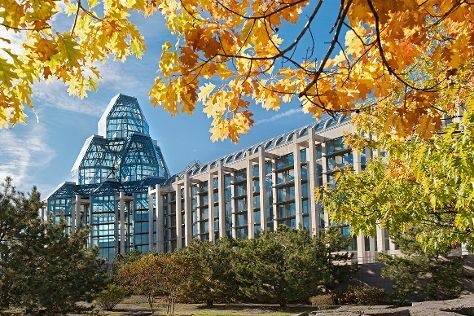 Finish your sightseeing early on the 11th (Sat) to allow enough time to travel to Ottawa. You'll discover tucked-away gems like Omega Park and Canada Aviation and Space Museum. Deepen your sense of the past at sights like Parliament Hill and Buildings and Notre Dame Basilica. There's still lots to do: examine the collection at Diefenbunker: Canada's Cold War Museum, wander the streets of ByWard Market, and learn about all things military at Canadian War Museum. To find photos, traveler tips, maps, and other tourist information, refer to the Ottawa holiday maker site . Getting from Regina to Ottawa by flight takes about 5 hours. Other options: drive; or take a bus. The time zone changes from Central Standard Time to Eastern Standard Time, which is usually a 1 hour difference. Plan for somewhat warmer nights when traveling from Regina in May since evenings lows in Ottawa dip to 9°C. Wrap up your sightseeing on the 15th (Wed) early enough to take a train to Montreal. On the 16th (Thu), pause for some serene contemplation at Notre-Dame Basilica, then get a new perspective on nature at Biodome de Montreal, and then take in the spiritual surroundings of Saint Joseph's Oratory of Mount Royal. Keep things going the next day: admire the masterpieces at The Montreal Museum of Fine Arts (Musee des Beaux-Arts) and then get engrossed in the history at Pointe-a-Calliere Museum. To find other places to visit, ratings, maps, and other tourist information, go to the Montreal trip itinerary maker site . Take a train from Ottawa to Montreal in 2 hours. Alternatively, you can drive; or take a bus. In May in Montreal, expect temperatures between 23°C during the day and 11°C at night. Wrap up your sightseeing on the 17th (Fri) to allow time to drive to Quebec City. You'll explore the less-touristy side of things at Lower Town (Basse-Ville) and Plains of Abraham. 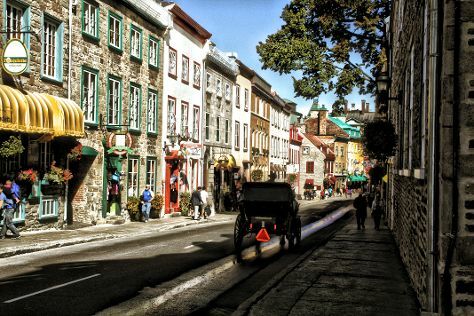 Visit Old Quebec and Place Royale for their historical value. Go for a jaunt from Quebec City to Sainte Anne de Beaupre to see Sanctuaire Sainte-Anne-de-Beaupre about 30 minutes away. The adventure continues: steep yourself in history at Basilique Cathedrale - Notre-Dame-de-Quebec and examine the collection at Musee de la civilisation. To find where to stay, other places to visit, photos, and other tourist information, refer to the Quebec City trip planner. You can drive from Montreal to Quebec City in 3 hours. Alternatively, you can take a bus; or take a train. While traveling from Montreal, expect little chillier days and about the same nights in Quebec City, ranging from highs of 19°C to lows of 9°C. Wrap up your sightseeing on the 20th (Mon) to allow time to travel back home.